ANIMALS UNITED 3D AT SHAW HOUSE ! Yes yes yes ! It's Animals United ! it doesn't seem like I would love it to the max by just looking at this Title. & Of courseeee, it's a title of an old storybook. THAT'S WHY. "Do not jude a book by it's cover"
That's not the main point ! I was just crapping all the way. When I was on my way there (I lost my way), I was thinking if it's going to be a nice show to catch. Ok, I was late (because I was lost! ), then I went in without popcorn (super regret! ), sat down, put on the 3D glasses. I didn't pay attention to the glasses when I grabbed it while on the way into the theatre as I was late already ! It's SUPER DUPER comfortable ! It's like even better than other Cinemas out there. Next thing was, I realise that my eyes weren't that strain even after quite a long time. I WAS SUPER SHOCKED BY THE GRAPHICS. JUST HOW MANY ZILLION YEARS DID THEY SPEND TO MAKE SOMETHING LIKE THAT ! Every animal is so DETAILED ! I'm so serious mannnzxzxzxz, it's really very detailed. Colours were bright and very coooooooool ! The storyline was superb (I cried and laughed, cried and laughed). I won't be a spoiler, so at most I can tell you that it's about having a heart? It's also quite of a comedy at some parts ! It's suitable for everyone, young or old, middle or nothing. I don't want people to say that I cheat them or the movie experience isn't good if you watched or whatever. WATCH IT AT SHAW HOUSE WITH 3D EFFECT. *I hope you all really READ it other than just browsing pictures then close the page. Hey! 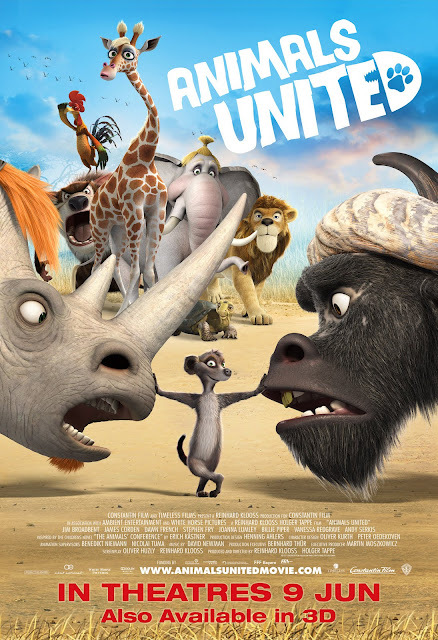 I watched Animals United too! And I was late too, because I lost my way! LOL. Teehee !!!!!! Mine drove me to the correct place ! But it's called Shaw Centre at the back so I thought it was the wrong place ! ): Then I walk till I really lost my wayyyyyy. Saw your blog ! Naiiiisu !